I enjoy more than doing a full face of makeup with all the bells, whistles and lashes. 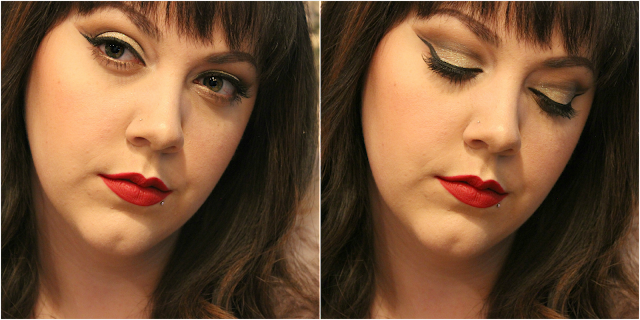 I hope you have fun holiday plans and enjoy this glamorous makeup tutorial. 1) After priming my face I cream contoured using Almond and highlighted using Alabaster. I used the liquis foundation in Ivory to blend everything, starting with the lighter shade and then the darker. 2) I then used Light Warm concealer to conceal and highlight further for that full glam effect and blended that all out. 3) Then I set everything with Smooth Operator. 4) Using the lightest shade in the Shade + Light palette I deepened the contour further. 5) Then using Scotch Tape to create a clean, sharp line and primed my eyes using Eden. 6) Using Naked from the Naked palette on a big fluffy brush and blended just above my crease and in the socket. 7) I then used Buck on tapered blending brush staying in the socket to begin a cut crease. 8) I went back in with Buck to just the outer corners to deepen the crease a bit. 9) On a fine angled brush I took Creep and created a sharp cut crease and then lightly blended it with a pencil brush, but not too much as not to lose the sharpness. 10) Then I primed the mobile lid with Greed (any metallic primer could work) to make Stargazer pop a little more on a flat shadow brush. 11) I then went back in with Creep to redefine the sharp crease. 12) Before removing the tape I did a extended wing with Aqua Black. 13) I used Virgin to highlight my brow bone and inner corner. 14) I placed Luminoso on my upper cheek and blended down. 15) I highlighted the high points of my face with Champagne Pop and spritzed my face with my primer water to rehydrate. 17) Lastly I slightly over lined my lips with Cherry lip liner and filled my lips with Hellbent. season. This makeup would show up wonderfully in color or black and white pictures so a great choice for any holiday occasion. I hope you and your family have a happy holiday season! !